Outstanding in the Field is "a restaurant without walls, a roving culinary adventure." They've been setting up the long table since 1999, showcasing local food and wine. I've wanted for the longest time to attend one of these events and was delighted to accept their kind invitation. The 2011 tour (May to the end of the year) includes several events in Canada and Europe as well as dozens across the US. This month suited my schedule best, and I saw one of my favorite destinations on the list for May. 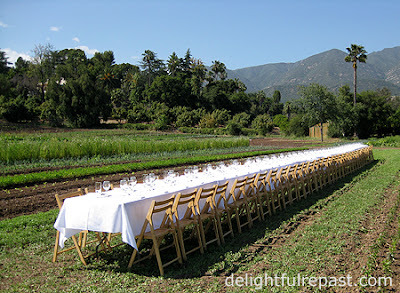 The venue for the May 11 event was Earthtrine Farm in Ojai, a short drive inland on California's Central Coast. This was the second time host farmers BD and Liz Dautch have welcomed OITF to their well-tended fields in the picturesque Ojai Valley. Guests gathered in the orchard at 4 o'clock for wine and passed hors d'oeuvres, followed by a tour of the small certified organic farm where the Dautches grow oranges and other fruits, vegetables and herbs, harvesting over a hundred varieties of produce throughout the year. After the tour, we all–-farmers, producers, winemakers, food artisans, diners-– settled in at the long table to share a delightful repast served family-style. Throughout the meal, local suppliers went around the table telling diners the story of their ingredients that went into the meal. Guest chef Rachel Main of Main Course California in neighboring Ventura prepared a delectable meal with ingredients from Earthtrine Farm, Santa Paula grower Dave Pommer, Ventura farmer Mary McGrath, Ojai's Watkins Cattle Company, Ventura's Ocean Pride Seafood and Santa Barbara Pistachios. Guest winemakers Mike and Chris Brown of Cantara Cellars in nearby Camarillo provided wines to complement each course: Lodi Albarino 2010 and Amador County Tempranillo 2008 with the hors d'oeuvres, Lodi Chardonnay 2009 with the chilled lettuce soup, Lodi Syrah Rose 2009 with the vegetable kimchi, Lodi Old Vine Zinfandel 2009 with the Baja yellowtail, carrot puree, tempura Japanese turnips and grilled sprouted broccoli. Part of the mission of Outstanding in the Field is to reconnect diners to the land and the origins of their food. Believe me, when diners are seated at the long table right there in the field eating foods just picked from that field, they definitely feel connected to the land! The other part of the mission of OITF is to honor the local farmers and food artisans. Mission accomplished! Check the Outstanding in the Field schedule for an event in your area or somewhere you'd like to visit. And mission accomplished by you; spreading the word and the experience! Thank you, Kris! It was a wonderful experience! Thank you, Sully! I would be happy to eat in a field (on a patch of fenugreek, on this occasion) every day of my life! What a wonderful wonderful idea! I couldn't think of a better dining experience or a restaurant with an ambiance more aligned with my values! (providing it wasn't raining that is...) If they ever bring Outstanding in the Field to Australia, I'll be attending for sure! Thanks for sharing this Jean. Glad you enjoyed the post, Grant! It's quite an amazing operation. I think we would need to check the weather forecast over here and take an umbrella just in case. "Taking an umbrella, just in case,"is a way of life here Jean. Do you lot grow your own vegetables in your back gardens or allotments? Since I retired form teaching I've been meaning to dig over part of my garden for vegetables. DIG FOR VICTORY and all that. Tony, they'll be having one in Ireland September 5 and one in Wales September 8. I'm sure they have a plan B in the event of rain, perhaps a marquee or a barn or something! I love growing my own vegetables in the back garden, but don't manage to do it every year. This year, for example, I'm probably not going to do anything but herbs and perhaps a tomato or two. It looks like they are coming to Phoenix in October. Phoenix should be lovely in October! I've been there in early November, and the evenings were magical. I've always wanted to experience something like this! And they are coming to Phoenix Oct 30th!!! YAY! Thanks for posting this, Jean! I wouldn't miss it, if I were you! A Phoenix late afternoon/evening at that time of year ... magical! I have only seen that kind of thing on TV and thought it was fantastic! What a great opportunity, Jean. I'm so glad you could be part of that. Hmm...Maybe I should host a dinner in my garden this summer! Judy, thanks! OITF will be heading to Wisconsin, so check the schedule. Mmm ... dinner in your garden would be fabulous.